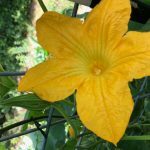 Summer squash is my favorite vegetable, and despite the jokes about gardeners inundating their neighbors with unwanted zucchini, it isn’t always easy to get a good crop! Squash, pumpkins, and some gourds are members of the Cucurbita genus that makes up one branch of the Cucurbitaceae family. Which can we grow in our Western North Carolina gardens? There are hundreds of cucurbits! Those grown in vegetable gardens belong to just a few species. Cucurbita pepo: This species includes most of our summer squashes—yellow, pattypan, spaghetti squash, zucchini—as well as acorn and delicata winter squash, miniature and “Jack-o-lantern” type pumpkins, and many ornamental gourds (yellow-flowered—white-flowered gourds belong to the genus Lagenaria). C. maxima: Includes the giant pumpkins, buttercup, Hubbard, kabocha, and turban winter squash. C. moschata: Tromboncino, often eaten as a summer squash, and butternut winter squash. C. ficifolia: Fig-leaf gourds, eaten as a summer squash. Think about the space you’ll need for your cucurbits before choosing varieties. Although many summer squashes have a bushy growth habit, some—as well as most all winter squashes, pumpkins, and gourds—take up a lot of space. 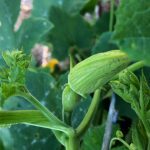 Cucurbits need warm weather and lots of water to prosper, so look at the dates needed from planting to maturity and be sure you can provide a site in full sun that you can keep irrigated. North Carolina State University periodically evaluates cucurbit varieties. For detailed observations, see the NCSU webpage Cucurbit Cultivar Evaluations & Variety Trials. Planting squash, pumpkins, and gourds from seed is often easier than transplants if you allow sufficient time from seeding to harvest. Although there is no need to plant in hills, this may be an efficient way to organize your garden. To save space consider using supports, such as A-frame trellises, for small-fruited cucurbits. Thin to two or three plants if you use hills, or follow seed packet spacing. 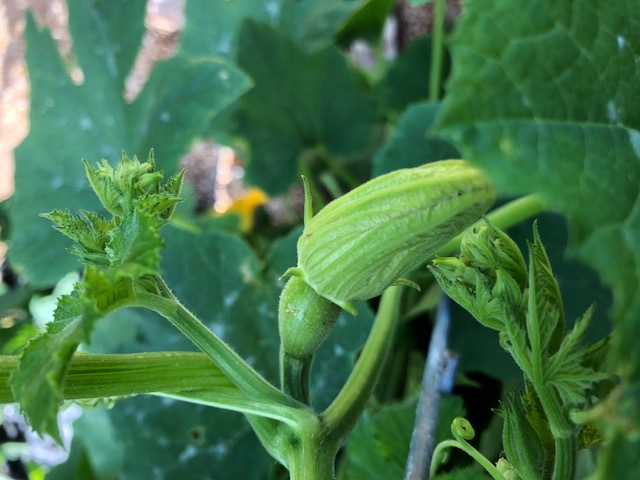 Cucurbits typically have male and female flowers—you can see an immature fruit at the base of the female flowers. You will often see flowers for a while before fruits form, or you may see immature fruits that don’t develop. Often the first flowers are all male, or the first female flowers may open when there are no male flowers open. If you don’t see insects pollinating your plants, you can pick a newly opened male flower and swirl the center structure (stamen) on the inside of open female flowers. Water. Keep your planting moist until seeds sprout. It is typical for leaves to wilt midday, but if they are wilted in early morning or evening, they need water! Water plants at the base, close to the soil—avoid handling and working when plants are wet. Mulch helps moderate soil temperature and moisture and keeps down weeds, but if you want plants to form additional roots along their stems, allow for some bare ground! Additional roots can help your planting survive insect attacks. Weed. Remove weeds as soon as they appear so you don’t damage stems when rooting out larger weeds once the vines start to run. Fertilizing. 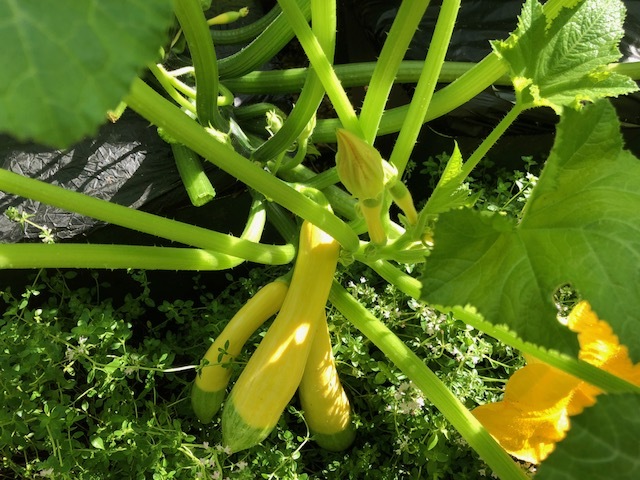 Cucurbits are heavy feeders, so prepare to fertilize regularly throughout the growing season. Insects and diseases to watch for. Squash beetles, bugs, and—especially borers—can spell trouble for the longevity of your plantings. Striped cucumber beetles can introduce both bacterial wilt and cucumber mosaic. Cucurbits are susceptible to both downy and powdery mildew. Harvest when the fruit is soft, tender, and 6 to 8 inches long (3 to 4 inches across for patty pans). The skin color often changes to a dark, glossy green or yellow, depending on cultivar. Pick every two to three days to encourage production…. Harvest pumpkins and winter squash before frost and after the vine dries, the fruit color darkens, and the skin surface resists puncture from a thumbnail. Avoid bruising or scratching the fruit while handling it. Leave a 3-inch to 4-inch portion of stem attached to the fruit and store in a cool, dry location with good ventilation. Note that winter squash may look ready to harvest well before they have matured! Gourds in the Cucurbita genus are soft-shell rather than hard-shell gourds; harvest before frost, and dry indoors. 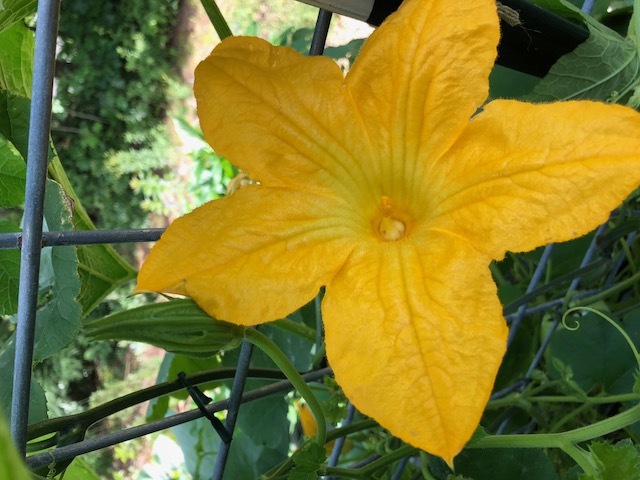 Note that you can also harvest squash blossoms for culinary use when they are about to open. I am already enjoying my summer squash this season, but you can continue planting until late July! Wait until next year for planting winter squash, pumpkins, and gourds.